Futaleufú is famous for it's world class white water, so while passing through, it made sense to have a go at rafting. We went white water rafting on grade 4+ rapids in New Zealand, so we knew what we were letting ourselves in for. After much walking around yesterday evening, we eventually reserved places on a raft which already had 4 people confirmed, so we would be in a full boat. Our reason for that is that there is an option to do an extra section of the river if the people on the raft are capable (and willing) . More people on the raft would increase our chances of doing the extra section. At 10am we met the other rafters and crew and headed back down the road we cycled up yesterday. The rafting set up here is slightly different to what we experienced in NZ, as each raft has a catamaran float type safely boat as well as a kayak accompanying it. After donning wetsuits and listening to the safety brief we headed out onto the water. The guide was bilingual so all safety info etc was given in Spanish and English. The commands to paddle were given in Spanish only though, so we had to learn those. We also had to jump out of the boat so the guide could assess our swimming ability, and practice pulling people back into the boat. The rapids in the main section were all taken without incident. A little different to our experience in NZ, where almost half the boat went for an unexpected dip! We were then encouraged to try floating through a grade 2 rapid. Even at that level, there was enough white water to make it difficult to get enough breaths. I wouldn't volunteer to swim through anything more extreme! After having to swim after the raft/catamaran to get hauled out of the water, and recover our breath we were offered the opportunity to do the extra section with the grade 5 rapids. Fortunately everyone else in the boat was up for doing them too. These were really quite fun, and again we managed to get through them without upset, if with total drenching! After a picnic lunch we headed back to town to resume our usual days off activities of eating, shopping, eating, bike maintenance and laundry. Another very successful day! 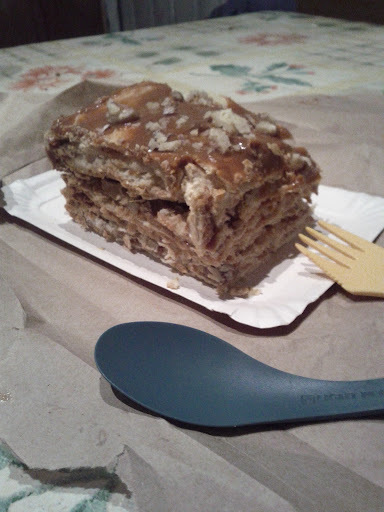 We finished with a nice meal out (fairly quiet despite the date) and a big chunk of dulce de leche cake (photo) whilst blogging back at the campsite. Tomorrow we cross back into Argentina for the third time, and head through some Welsh (!) towns and to the lake district.